The Patriot Guard Riders having been invited by the family of fallen US Army WWII Veteran, PFC Jack H. Buescher, to stand and honor during his interment service at the Diamond Crest Cemetery, Susanville, CA. 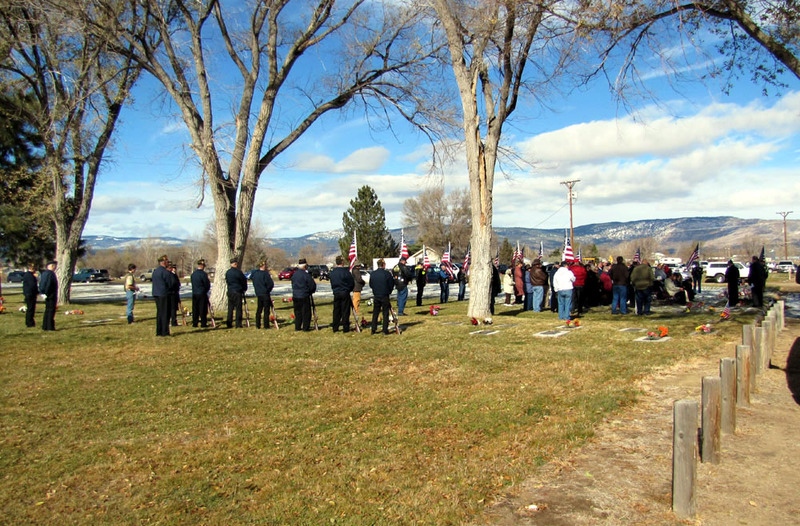 The mission involved a flag line at the Diamond Crest Cemetery in Susanville, CA. for family and friends to pass through. On a clear winter day, 19 PGR members showed to present Honors for this true American Hero where the PGR stood Honor line at his final resting. PFC Jack H. Buescher served his country proudly from 10 Sept 1951 to 24 Aug 1953. He was a proud US Army veteran who after his discharge from the US Army, went to work for Lassen High School as an instructor from 1956 to 1963 then went to work for the California Department of Corrections as an instructor from 1963 to 1984, retiring after 21 years of service. PFC Jack H. Buescher touched many lives here in the Susanville area and due to his love of life, his sense of humor and his love for his family; he will be missed by many. Lastly, but not the least, I am thankful to PFC Jack H. Buescher, US Army Veteran, an American Hero and his family. Your watch has been stood, your duty to protect this nation is complete, and you’ve earned the right to be called a true American Hero. Your service and sacrifice will not be forgotten.